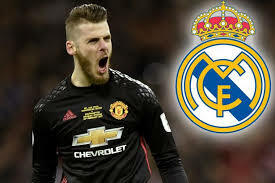 Portuguese international Cristiano Ronaldo has reportedly told Real Madrid chiefs to bring Manchester United goalie David De Gea to the camp Nou next season. The Spanish goalkeeper has for years being a target for Los Blancos, and Ronaldo believes Real Madrid can sign the Spaniard at the end of the season. According to the report by Don Balon, Ronaldo named David De Gea in a meeting with the club's chiefs as a player he wants to play with next season at the Bernabeu. The report added that Ronaldo has also told Real Madrid president Perez to sign PSG defender Marquinhos and Valencia ace Goncalo Guedes. But Manchester United manager Jose Mourinho has been vocal on De Gea’s future in recent weeks with the Special One saying United will not sell their No.1.